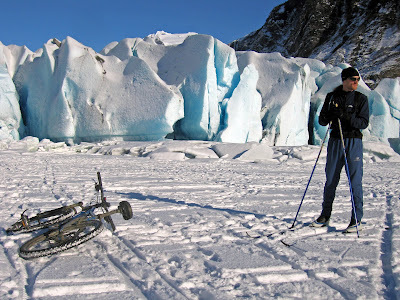 Geoff and I skim across the surface of Mendenhall Lake, he on skate skis, me on “studs” and a mountain bike. Side by side, we glide steady at 10 mph. He slashes up the groomed track; I draw a straight line through several inches of dry powder. The flat surface radiates a blaze of unfiltered sunlight, blinding to the point of hypnotizing. Through a heavy squint, all I can make out is a white slate stretching uninterrupted for more than a mile in all directions. The tracks of others veer off in shadowed tangents that remind me of curves on a line graph; their creators stand at variable points in the distance. Geoff and I move parallel along the axis, where I can’t help but weave through a barrage of vague images from 11th-grade calculus. After standing in the shadow of the glacier terminus, much too close for comfort, we veer off the lake and hit the moraine trails. 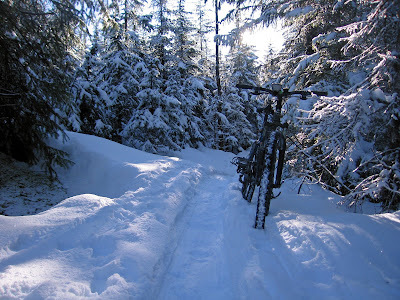 Inches of new snow slow us both down, but we push on through the the crackle and click of powder-dusted singletrack. Rides like this, when surging up even small hills is a losing battle against sand-like resistance, can at times be sweaty, heart-pounding work. But on days like today, when the forest is full of sweaty people smiling in the sunlight, they can hardly be counted as workouts. I think about where 2007 has taken me so far ... simple moments of awe and joy cut like razors through my daily routine. I think back to the holiday season, spent thousands of miles away from my family, and how it was in turn overwhelmingly hectic and largely meaningless. The first six weeks of the new year, on the other hand, have been full of selfish gifts and selflessly quiet reflections. When I began training for the Susitna 100, I embarked on a journey so daunting and encompassing that I could be forgiven for letting social, financial and domestic obligations fall by the wayside. It was a holiday from myself, from the day-to-day hassle and general realities of life. And now that it’s nearly over, I’m like a kid counting down the days until Christmas - almost blind with anticipation but, at the same time, already feeling a sense of loss for the inevitable day after. Ah, yes. 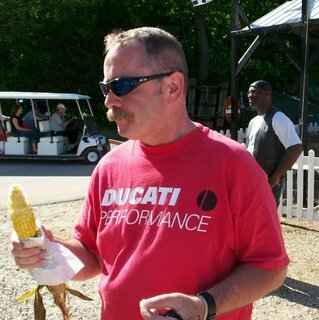 I have always suffered from a bit of the post-race depression that always follows the really "big" races. All you need is another goal within reach. I'm sure you'll think of one! Beautiful photos again Jill. Look forwards to the day when real life feels like a rest, then really enjoy the onset of itchy feet again. I long to move to the arctic, but haven't seriously thought I could really bike there. Your mileage is impressive and makes me think I could do it. Outstanding pics - thanks for posting! I stumbled upon your BLOG a week or so ago, and have pretty much caught up. I just love your writing and the way you describe so well your training experiences! The pictures are great too! Beautiful country! I'm inspired by your training as I just started muntain biking a year ago and have registered for a 67 kilometer race called The Test of Metal in Squamish BC. You can Google it for more info, but I was lucky to even make it in as the 800 person online registration sold out in 48 minutes! Anyways, keep writing and best of luck in your race! good luck with the sustina, jill. please be safe out there and have fun. push, push, push!